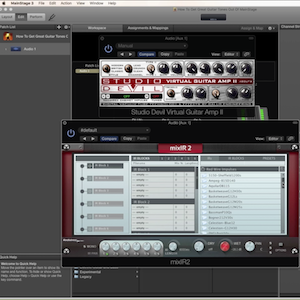 Here’s the 3rd installment of videos around getting great guitar tones from a computer using MainStage. This video showcases how to split up guitar sounds into multiple patches to switch between within songs. 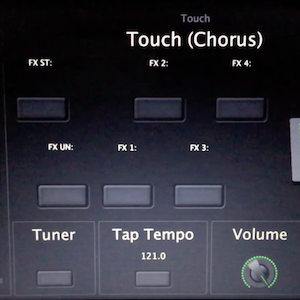 The reason behind setting them up this way is simple – it’s the best way to control the system for the Tuning function, as well as for making patch changes function via a single button press. Because we all love simplicity when playing live. 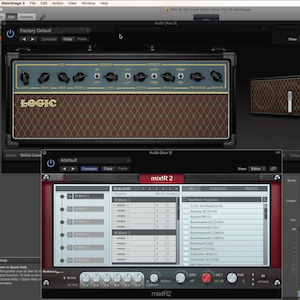 Part two in my getting great guitar tones in MainStage talks about creating multi amp setups. Imagine if you could take the amplifier rigs of people like The Edge, Joe Bonamassa, Aerosmith, Joe Satriani, and reduce them down to a single laptop with a midi foot controller. You can. Watch and find out how. This is scratching the surface of what this software is capable of doing. See me live and join the revolution in guitar tone by utilizing multi amp setups to achieve big sounds. I’ve been doing a lot of recording in the past several years where the guitar tones are important. Who am I kidding? Guitar tone is always important. 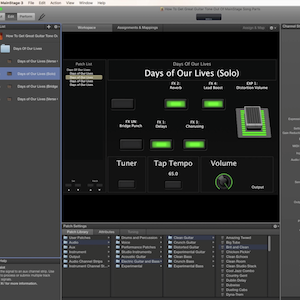 I’ve recently made the switch to using software and computers for all my guitar sounds and amplification. One thing I’ve found in my exploration of sound is that there is more than one way to get great guitar tones. This is a different mentality from a majority of guitar players that believe there is only one way which involves a classic guitar and a hardware amplifier. No matter where I go and mention that I’m using a computer for my guitar tones, I get people that say its not possible. Not possible that is, until they hear it. Then they change their minds. Looking around on YouTube and other parts of the internet, I’ve been unable to find anyone who is really showing how to use a computer to get great tones. Thus I recorded a short series of simple tutorials on the subject. Here is the first one that gives a beginning look at how I’m doing it and part of what I’m using software wise. The revolution is here. Enjoy and stay tuned for the next two videos.